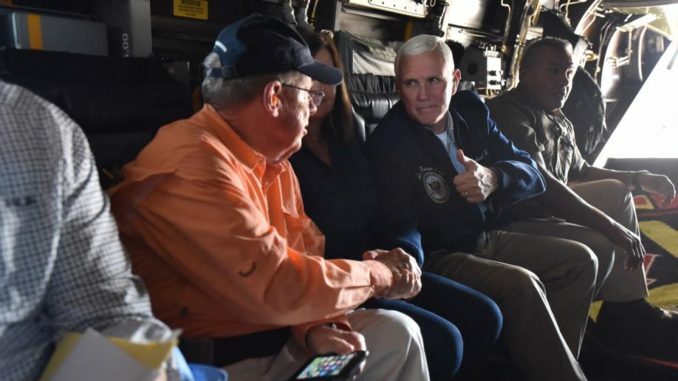 On Tuesday, Vice President of the United States Mike Pence met with Southwest Georgia farmers whose crops were impacted by Hurricane Michael. Pence was accompanied on the tour by U.S. Secretary of Agriculture Sonny Perdue, who is also a former governor of Georgia, as well as other state and federal officials, including U.S. Senator Johnny Isakson (R-Georgia), U.S. Senator David Perdue (R-Georgia) and Georgia Agricultural Commissioner Gary Black . Second Lady Karen Pence also joined the vice president on his travel through Southwest Georgia. The vice president arrived in Albany, Ga. via airplane shortly before noon Tuesday. 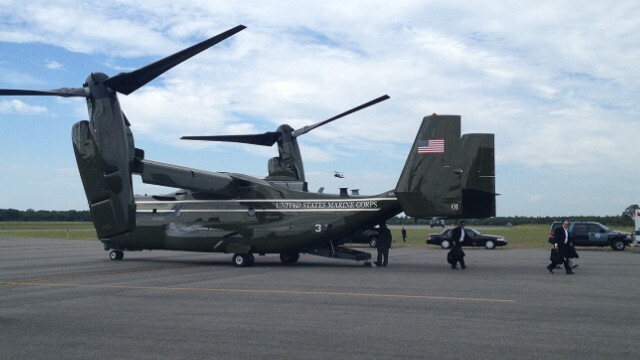 He used Marine One, a VH-22 Osprey aircraft, to make several stops across Southwest Georgia. Pence also spoke to farmers attending the Sunbelt Agricultural Exposition in Moultrie, Ga. Pence said the hurricane has caused an estimated $2 billion in damage to the state’s cotton, pecan and peanut crops. The vice president also toured Flint River Mills in Bainbridge, Ga. FRM has been in operation for 90 years and provides feed for about eight states across the Southeast United States. Speaking at Flint River Mills, Georgia Agriculture Commissioner Gary Black said officials estimate the hurricane has caused a loss of greater than $1 billion to vegetables and pecans grown in Georgia and added estimates were not yet complete on the state’s peanut, cotton and timber crops. Black said the current damage estimate includes $480 million in damage to vegetables and $600 million in damaged to pecans. Decatur County is the leading grower of corn in the state, and is in the top 10 for peanuts, cotton and several other row crops, according to FarmGate statistics. U.S. Representative Sanford Bishop (D-Albany) also spoke at FRM. The vice president also visited Pecan Ridge Plantation, located near the town of Brinson in Decatur County. The plantation is owned and operated by Rob and Eric Cohen and their families. 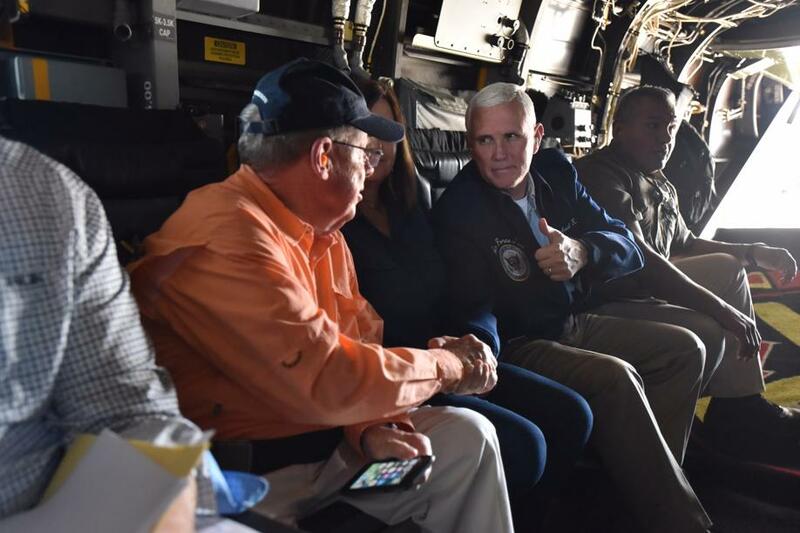 Pence said he was thankful for the work of first responders in the immediate aftermath of the storm, and pledged that state and federal agencies would work together to bring Southwest Georgia. U.S. President Donald Trump visited Macon, Ga., on Monday to survey storm damage, and also visited the Panhandle of Florida. The Marine One Osprey helicraft. Federal funding will be made available to state, tribal, and eligible local governments for emergency work in the counties of Baker, Bleckley, Burke, Calhoun, Colquitt, Crisp, Decatur, Dodge, Dooly, Dougherty, Early, Emanuel, Grady, Houston, Jefferson, Jenkins, Johnson, Laurens, Lee, Macon, Miller, Mitchell, Pulaski, Seminole, Sumter, Terrell, Thomas, Treutlen, Turner, Wilcox, and Worth. Residents and business owners who sustained losses in these counties could begin applying for assistance Monday by registering online or by calling 1-800-621-FEMA(3362) or 1-800-462-7585 (TTY) for the hearing and speech impaired. How about tree farmers in SW GA who sustained significant damage and loss to pine trees? What is their recourse for this devastating loss of their crop. Some of these are pine trees that have been planted 30-40 years and are not salvageable. There has been a lot of money, energy, time and resources, plus maintenance in this endeavor.